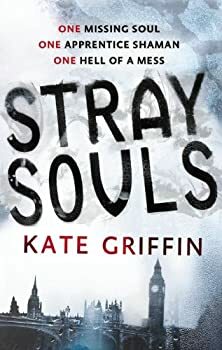 Kate Griffin is the name under which Carnegie Medal-nominated author, Catherine Webb, writes fantasy novels for adults. An acclaimed author of young adult books under her own name, Catherine’s debut, Mirror Dreams, was written when she was only 14 years old, and garnered comparisons with Terry Pratchett and Philip Pullman. She read History at the London School of Economics, and studied at RADA. Learn more at Kate Griffin’s website. Catherine Webb also writes under the pseudonym Claire North. Matthew Swift — (2009-2012) Publisher: For Matthew Swift, today is not like any other day. It is the day on which he returns to life. Two years after his untimely death, Matthew Swift finds himself breathing once again, lying in bed in his London home. Except that it’s no longer his bed, or his home. And the last time this sorcerer was seen alive, an unknown assailant had gouged a hole so deep in his chest that his death was irrefutable… despite his body never being found. He doesn’t have long to mull over his resurrection though, or the changes that have been wrought upon him. His only concern now is vengeance. Vengeance upon his monstrous killer and vengeance upon the one who brought him back. Magicals Anonymous — (2012-2013) Set in the same world as MATTHEW SWIFT. Publisher: Sharon Li has just discovered she’s a shaman. And just in time: London’s soul has gone missing. If anyone can solve the mystery and rescue the dying city, she can, but she’ll need help-from the support group she’s just set up for people with magical issues. Among them are a vampire who is O, a druid who suffers from allergies and a lack of confidence, and a banshee looking for an evening class in impressionist art. Now, this motley crew must find a way to save the world …. I think maybe I love Kate Griffin’s A Madness of Angels. It’s a mature love, too, not just a crush, because I can see the faults in the thing and I love it anyway. It’s a hard book to write about without spoiling the fun for everyone, so instead of discussing the plot I will focus on what I loved. I love Griffin’s view of magic. 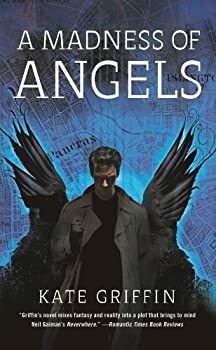 Reviewers compare A Madness of Angels to Neil Gaiman’s Neverwhere, and those comparisons are apt. This is a book, first and foremost, about London, a magical London that is as close to our London as the next bus kiosk, the Tube or that pigeon waddling toward you looking for a handout. I loved Kate Griffin’s A Madness of Angels. I merely enjoyed the sequel, The Midnight Mayor. This is not an uncommon experience to have with a sequel. I think part of the problem comes from the amount of time devoted to the first novel, when the writer had years to re-imagine, revise, reread and rethink; time to burnish that pivotal paragraph or really dig deep to capture that motivation, contrasted with the length of time allowed with Book Two of a multi-book contract. The Midnight Mayor seems to suffer from a lack of the deep and loving detail the reader saw in A Madness of Angels. 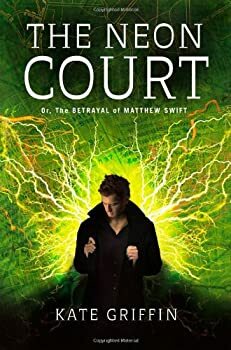 The Neon Court, Kate Griffin’s third Matthew Swift novel, starts out with high drama as Matthew, urban sorcerer and Midnight Mayor of London, abruptly materializes on the top floor of a burning building. Oda, a member of the fundamentalist, magic-hating Order, has used a summoning spell to bring him there. This is enough, in her belief system, to damn her soul. Oda is dying, or at least, she should be, since she has been stabbed through the heart and is weeping tears of blood, but she is still surprisingly animated, and she needs Matthew’s help, although he doesn’t understand what she is asking. 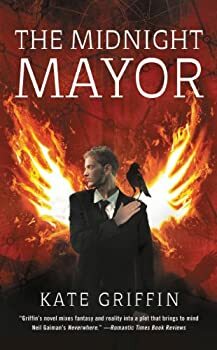 The thing that gives Matthew Swift, London’s last urban sorcerer and Midnight Mayor, his extraordinary power is that he loves London. He loves the gritty streets, the posh apartment buildings, glowing graffiti, the blowing trash, the murky river, the pigeons, rats and urban foxes. He loves the underground, the trains, buses and cars. He loves the hole-in-the-wall diners and take-outs, the stink of diesel and petrol fumes, curry and incense. 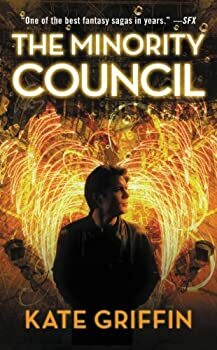 It is this love that gives him his power, and this love that makes Kate Griffin’s The Minority Council the best MATTHEW SWIFT book since A Madness of Angels. I am a big fan of Kate Griffin’s MATTHEW SWIFT books. I think her love of London; the majestic, the beautiful, the historic, the grungy, the run-down and the shoddy, powers those books, as does a system of magic that grown organically from the city (or, as Swift puts it, “Life is magic.”) With Stray Souls, Griffin introduces another character and what appears to second series set in the same magical universe; the MAGICALS ANONYMOUS series. 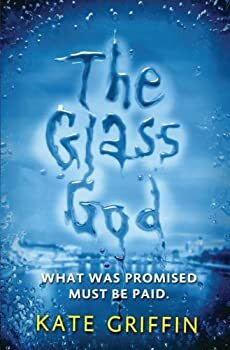 The Glass God is the second book in Kate Griffin’s Magicals Anonymous series. These books are set in the same magical London as the MATTHEW SWIFT books, but follow the character of Sharon Li, barista turned shaman turned “community support worker” for various magical beings in the greater London area.